I have a Place available. Happy to transfer. I also have a place that i'm willing to transfer. Does anyone have a place available for transfer for the Abingdon marathon. If you do please PM me. My place has been taken. Training has been going well - only 3 weeks to go now so the hard slog is over! I did a 12 week plan this time rather than my normal 18 week training plan and I definitely feel fresher for it. Just hope I'm not fresher because I'm under trained with the shorter plan! Reg: you should be in good shape for a crack at sub 2:45 with the IM stuff and having run a 3:13 very comfortably. Not long now, anyone know if there are pacers ? looking to plod around at 4 hour pace and don't want to lonely ! I will be in this kind of time from too, although I think I maybe a bit slower than 4 hours now. Hoping a few of us plodders can naturally find each other out there. Pretty ecstatic that I might actually make it to the start line to be honest. All was going well until I developed Hip bursitis a few weeks ago. This was combined with a new born baby and a severe lack of sleep, plus a head cold! It was no better after a weeks rest so I decided to give it 3 weeks and really work hard on strengthening cross training and diet in those weeks. Last week the hip pain still appeared to be there so I was considering transferring my place.. but on Sunday I just went out and gave it one last go. Managed 7 miles with a bit of soreness but no pain, then 5 miles yesterday with even less trouble. I am going to try 20k tomorrow and if I get though that without any issues I think I can give it a crack still. My plan after tomorrows run is just tick over with a few miles and taper nicely then just go out and give it a go. It is my first marathon so I don't really care about time. I had got up to 35 miles a week with several 15 miles runs before the injury hit so I think I have some kind of base to work from. I have been doing 3-4 hour workouts on the bike and in the gym to replicate the cardio effort needed while I have been injured. I am low carb, high fat and have been for a year so my fuelling strategy is good and well tested (basically use UCAN powder). Also managed to lose 10 pounds while I was unable to run so that should help no end. With a bit of luck I will make it to the start line! I know I can get up to about 15 miles so its going to be unknown territory after that. Got my number yesterday so starting to feel excited. Not too long to wait now. Last long run on Sunday and then it will be taper time! Is most of the race on roads or pavements? Only a week to go now not feeling to well so hoping that passes! On the taper now fingers crossed. Does anyone know if they give gels out on the course? I did it last year but just cant remember if they did or not, I know there was energy drink available as you started the second lap. Anyone started checking weather forecasts? Looking a bit windy Tom! For anyone who's done Abingdon before or knows Abingdon, what's the best option for parking? I looked at the recommended places and there doesn't seem to be a huge amount of parking. I was thinking of driving up by myself and my family were thinking of coming up later to see me finish. I'm concerned that, with road closures, they might not be able to get to the car parks. At the moment the forecast looks alright Tom. A bit of a westerly but not too bad and about 10°C. Im feeling a bit more hopeful as I think I might have got on top of my hip issues. I managed 15 miles a couple of weeks back with limited pain and they have improved since then. I got through 6 miles of the course yesterday in 4 hour pace and no pain but have definitely decided from that to run at around 4.20 pace. Its my first marathon so I just want to get around in one piece. Weather looks windy but the course is quite well sheltered in places and lots of direction changes so its swings and roundabouts. TheRedEyeJedi - Thanks for that info, much appreciated. Just checked for the first time and it does look pretty windy! Don't like the look of that northerly. Looks like about 18mph cross wind (that would be slight tail wind coming home). Will hit you around the ring road at the start and heading into the business park area each time. Could be worse! Thanks for the info. Getting very nervous about the time limit as I am a plodder and the added fun of wind ! Storm Brian is on his way for the weekend! Let's hope he does his worst before Sunday morning. Good luck tomorrow everyone. Hope you all go really well and enjoy it! Proper windy out there today! Finished in 3:20 which is a 10min PB - over the moon with that in those conditions. There seemed to be lots running. 3:30 or 3:15 so I was caught between a rock and a hard place and had to tough it out alone for long stretches so delighted to get home on target. 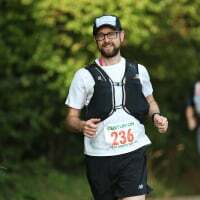 Very glad to get my first marathon in - went out at a really solid pace but it unravelled from about 14 miles and became a bit attritional after that. had a stitch that crippled me every time my heart rate went up so it was walk, jog, run all the way back. I knew I had enough time to play with for the cut off which helped. pleased with that as I didn’t think I would start three weeks ago and only got up to 15 miles on my long runs. A lovely event with great marshals. Well done everyone for seeing it through in what were tough conditions. I found the wind really pushed me back. I equalled my PB of 3.09 but was in form to do around 3.05. Maybe next time. Great BBQ food at the end! !